The Remington RM5118R Rodeo is an impressive chainsaw; it truly is. Why? Well, because you get a lot of chainsaw for very little money. The RM5118R gas chainsaw has plenty of power (51cc) for your cutting tasks around the house, but what’s truly surprising is that it also has anti-vibration handles, which is basically unheard of at this price point. Remington has created a classic chainsaw here and history shows that customer satisfaction is very high — don’t take my word for it, read the Amazon customer reviews on the RM5118R. We’ve covered the RM5118R in many articles at Chainsaw Journal because it’s well-worth the money. The only real criticism we have for the RM5118R is the weight — at 17.5 lbs. it’s fairly heavy, so it’s best suited for those who are strong and who can safely handle the extra heft. 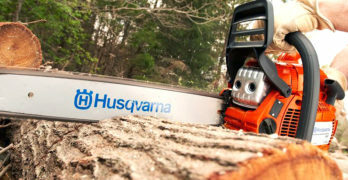 As a frame of reference, the comparable Husqvarna 450 weighs only 13 lbs. That’s a significant difference in weight, but the Husqvarna costs significantly more, but in all honestly, it’s a superior product. If you’re looking looking the Remington RM5118R Rodeo it’s likely because you have a limited budget. As far as value goes, the Remington RM5118R Rodeo is one of the best gas chainsaws for the money. Overall, it’s quite a bargain. Everyone is always in search of the next life hack at the moment. They’ll do anything to make each day a little easier by doing things they’ve never done before. One of them is definitely adding a chainsaw to their power tool collection, which wasn’t too popular in the past. Now it seems like everyone is interested in them because of the time they’ll free up. Something like a Remington RM5118R Rodeo is designed specifically for the average consumer and it’s cheap, so you can see why they’re appealing. We’ll dig into it more by looking at the jobs you’ll be able to carry out. It’s heavy at 17.5 lbs. Not a problem if you’re physically strong. 51cc 2-cycle engine with 18-inch low kickback bar and chain. Quick and easy starts in all conditions equipped with QuickStart technology making pull starts easier. Electronic ignition. Front and back anti-vibration handles for your own safety and comfort. Durable die-cast chassis and pro-grade crankcase and sprocket . Includes heavy duty case and bar and chain oil. It’s likely everyone has heard of the Remington brand, but you probably don’t associate them with chainsaws. That is strange because they actually released their first chainsaw over 60 years ago, which means they’ve had decades to perfect them. The RM5118R Rodeo is one of the top models available when you compare the price to all the features it offers. If you need a chainsaw in your garage it’s hard to find a better deal, but let’s look at the top features so you’ll know what it’s capable of. Includes this high-quality hard plastic case. Wonderful package! Please Note: We’re going to focus on the top features today, but it offers a lot more. If you’d like to research the chainsaw further click on the link for more details. The RM5118R Rodeo has a 51cc 2-cycle engine powering a premium 18 inch bar and chain. It’s long enough to tackle any tasks you’ll come up against in your garden and it’s very impressive considering how cheap it is. You’ll get a pro-grade crankcase and sprocket to help make cutting wood even easier. The low-kickback bar will allow you to work without worrying about any accidents, so it’s ideal for those without much chainsaw experience. Even when a chainsaw isn’t cutting through anything you can feel its power in your hands. Once it does eventually plunge into wood it will begin to shake vigorously, which will take a toll on your hands. The anti-vibration handles on the front and back of the chainsaw won’t make the shaking stop, but the chainsaw will be easier to hold. You’ll also be able to work for a lot longer before you’re so fatigued you have to take a break. Remington has been making tools since 1921. Pulling on a cord non-stop to start a chainsaw isn’t anyone’s idea of fun, so the QuickStart technology inside the RM5118R Rodeo is wonderful. It will allow you to start the chainsaw within seconds once you’re ready to begin cutting. The technology will also save you valuable energy, which you’ll notice if you start and stop the chainsaw a lot. 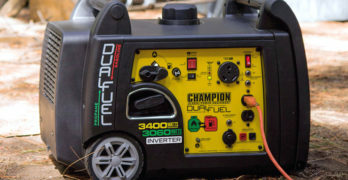 Due to the fact it has an electronic ignition built into it your starts will be more reliable too. We’ve already touched on automatic oilers, which you’ll get when you purchase the Remington RM5118R. It will keep your chain lubricated at all times and you won’t have to worry about doing it manually in the middle of a job. The automatic oiler on the RM5118R Rodeo is adjustable, so you’ll get to control how lubricated the chain is. Oil will help you with smoother cuts if it’s what you need, plus it’s essential for preventing any injuries. Engineered for comfort and durability. Minimum vibrations and a lubricated chain will help you control the chainsaw, but it’s not enough. Without large bucking spikes on the chain it could easily slip as you’re trying to cut into a piece of wood. They will offer you more control than usual even if you’re up against the toughest wood. The tension of the chain will affect things like the bucking spikes too, but there is a tool that will let you adjust it. Most commercial chainsaws are designed to take a beating because of the environments you’ll use them in. Even though the RM5118R Rodeo is unlikely to leave your garden it has still been built to withstand whatever you throw at it. The die-cast chassis is extremely durable and solid, which is great for something weighing only 25 pounds. The chainsaw also comes with a heavy-duty case so it can be stored away safety without you worrying about it when it’s not in use. The Remington RM5118R Rodeo isn’t going to break easily, but we all know things can sometimes go wrong. Remington has acknowledged this by giving everyone who buys their chainsaw a limited 2-year warranty. It’s a basic warranty you’ll find comes with many other chainsaws, but it’s a big bonus considering the price. If anything goes wrong they have an excellent customer support team ready to help you out as soon as possible. Learn more on the Remington site. If you’re serious about buying a chainsaw you don’t necessarily need to buy a basic model. There are professional options out there that will possibly be well within your price range. We’re going to look closely at a couple now in case you want a step up in price. Please Note: We’ll touch on some of the amazing features like before, but please click on each link to read more in-depth about each chainsaw on Amazon. Overall, this is well-worth the money. One of the best balanced chainsaws. It Has Special Husqvarna X-Torque Technology – The engine on the Husqvarna 450 uses a special X-torque technology. This was carefully designed to protect the environment while saving you money at the same time. Your fuel consumption will be reduced by 30 percent and when you can save a third on gas it will add up over time. The biggest difference is the 60 percent reduction in dangerous emissions, which will have a positive impact on the environment. 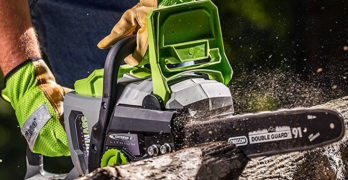 The Chainsaw Weighs A Little Over 10 Pounds – One area where professionals chainsaws stand out is the engine, but their weight is usually a close second. It’s something you’ll know immediately when you pick up the Husqvarna 450. It only weighs 10.8 pounds, so it will feel like nothing when you’re working for hours. When you compare it to the Remington RM5118R it’s less than half the weight. It’s a feature that could be worth the extra money alone. A Built-In Centrifugal Air Cleaning System – There is a powerful engine in the Husqvarna 450, so it’s obvious they would do everything they could to protect it. One such feature is the centrifugal air cleaning system. It’s supposed to remove harmful debris before it has a chance to reach the filter. This will extend the life of your engine. The three-piece crankshaft has also been forged and compressed so it can handle years of use. An Ergonomic Trigger Makes It Easy To Handle – This model has an ergonomic trigger to help you operate the chainsaw easily. You’ll be able to use it without any issues when you’re wearing gloves in the middle of winter. There is also another few features that will make it effortless to use. You already know about the anti-vibration technology because we’ve discussed it, plus the asymmetrical handle will give you more control over the tool. You Won’t Need Any Tools For Chain Tensioning – The RM5118R Rodeo required an external tool to adjust the tension of the chain, but the Husqvarna 450 will be able to do it without extra tools. Other features will make things simpler too. For example, it has a snap-lock cylinder so you can change spark plugs quickly. You’ll also have instant access to clean out the unit. The fuel indicator letting you know when you’re running low on gas will become invaluable. Ultra-lightweight at only 12.3 lbs. Professional quality. The Chain Brake Is Designed To Keep You Safe – Your Makita DCS5121 chainsaw will have a durable two point inertia/mechanical chain brake to keep you safe. You’ll probably want to know why it’s necessary in the first place. If your chainsaw was to kick back you wouldn’t have enough time to hit the brake, which could cause a serious accident. You won’t have to worry because this system will stop the chain automatically when it loses control. A Dual Spiked Bar Will Increase Productivity – There are bucking spikes on the RM5118R Rodeo, but the Makita DCS5121 takes it to the next level by giving you a dual spiked bar. It’s actually a lot more effectively designed. They have two specific purposes and we’ve already covered your ability to have more control when using the chainsaw. You’ll be able to tear through wood more easily too, so your overall productivity will increase. It Has Extra Large Fuel And Oil Tank Openings – When you’re working with a gas-powered chainsaw you have to use gasoline and oil. They can cause all sorts of problems if you spill anything, so it must be avoided at all costs. Makita included extra large fuel and oil tank openings on the chainsaw to ensure you don’t miss. It also has S-form caps on each tank to aid you in opening and closing them without any difficulty. The Power To Weight Ratio Is Extremely High – Makita are one of the top power tool brands in the world, so it will come as no surprise the DCS5121 has a great engine. You’ll get 3.3 horsepower under the hood of the chainsaw. It’s not a significant amount of power on its own, but it’s remarkable when you consider it only weighs 12.3 pounds without the bar and chain. The engine has a maximum speed of 13,800 RPM when it’s not cutting through wood. Slide Out Baffle Will Help In Cold Conditions – If you think carefully it’s usually in cold conditions you’ll need your chainsaw the most. This might be in a terrible storm or when it’s so cold you need to burn logs. A lot of chainsaws aren’t necessarily designed to work in very cold conditions even though they sometimes do, but they could still let you down. The slide out baffle on the DCS5121 can be configured to operate in low temperatures. You’d be a fool for not wearing protective safety gear. Safety first! The Hard Hat Will Offer You UV Protection – If you’re working outside all day in the sun it’s dangerous for your skin. Thanks to the Husqvarna ProForest helmet you’ll have UV protection even if you forget your sunscreen. It Has An Adjustable 6-Point Suspension – If sometimes lands directly on your head when you don’t have a helmet on it will cause a lot of direct damage. The 6-point suspension will spread out the force of impact to protect you. Comes With A 25 dB Noise Reduction Rating – Gas-powered chainsaws are loud and will damage your hearing. This helmet will reduce the noise by 25 decibels, which will save your ears from permanent damage. A Face Screen Will Keep Your Eyes Safe – Ear protection is an absolute must, but you normally have to wear goggles too. The face screen you get with this all-in-one helmet will protect your eyes from flying wood chips. People Will See You In All Weather Conditions – The helmet is the brightest shade of orange you’ll find, which will allow anyone to see you no matter the conditions. Also, if it’s wet the rain neck protector will keep you comfortable. Do You Need The Remington RM5118R Rodeo Chainsaw? If you really need a chainsaw to get you started you won’t find anything better than the RM5118R when taking the price into consideration. Along with the professional models we’ve looked at, you’ll be able to take care of every garden-related task we’ve talked about today. It’s always hard coming up with such a big decision on your own, so you should look to the outside for help. Read the unbiased reviews on Amazon and you’ll see how people really feel about the chainsaws. It’s guaranteed to make your decision a lot easier. Why you Need A Chainsaw? If you find yourself doing any of these jobs manually a chainsaw is the ultimate solution. Maybe you’ve not attempted them on your own before, but you’ll be able to take care of everything in the future. This is the number one thing you’ll use a chainsaw like the RM5118R Rodeo for because it’s impossible to do manually. You can get away with using a saw for a while, but in the long term you’ll only waste hundreds of hours of your life doing things manually. You don’t even need to have a wood burning fireplace today, although it’s certainly an extra bonus if you do. This is because fire pits are popping up in gardens all over the country and depending on which kind you buy you’ll need wooden logs to fuel it. Have you ever tried to remove a tree from your garden once it’s fallen over? If there is a storm strong enough to rip a tree from the ground it doesn’t necessarily mean you’ll be able to drag it away. You’ll need your chainsaw on hand to cut it up. It has the ability to save you in emergency situations too. Walk outside after a hurricane and you might find trees all over the place. A chainsaw is the best power tool to cut a path through obstacles standing in your way, so it’s a good thing to have around. It’s hard to cut multiple shrub stems with a regular saw, but with a chainsaw like the RM5118R Rodeo it will take you seconds. If you have a lot of trees in your garden you’ll need to keep the branches trimmed before they become unattractive and block out all the sunlight. Those with a little creativity inside them can also be a bit more artistic in the way they trim their bushes and trees. Cutting up an old wooden shed is possible too. You will essentially open up a whole new world of gardening duties you’ll be able to perform. In a second we’re going to look at the Remington RM5118R Rodeo chainsaw, which is the ideal model for the average consumer. Still, it’s going to have a lot of special features that separate it from other basic models. Think of those as the cherry on top of the cake. We’re going to assume all chainsaws you’ll be able to buy are powerful enough. After all, we’re looking at gas-powered ones you’ll be using at home. Even though they can cut through anything you throw at them it’s important they last a long time. It’s pointless owning a chainsaw with a gas tank so small you have to stop multiple times during a job. If your chainsaw has a decent runtime it’s going to save you a lot of time and effort, plus it will encourage you to tackle larger jobs. Another feature that will help you out a lot is the length of the bar. Can you imagine how difficult it would be if you couldn’t cut your wood in one go? You’d need to turn it around or reposition yourself all the time. This probably won’t affect you much when working at home, but it’s still nice to have the extra length at your disposal. When it’s too long it will affect you negatively too, so try to stick to one 16-18 inches in length. Using a chainsaw isn’t easy for everyone because it’s a dangerous tool. You’ll feel a lot more relaxed when you’re comfortable, which can mean many different things. The first one you’ll want to pay attention to is if the chainsaw is light. It also needs to be designed so it’s easy to hold in your hands for long periods of time. Once you start to feel uncomfortable holding a chainsaw it’s not good. Extras like anti-vibration will come in very handy. Before you can get around to using your chainsaw you’ll need to turn it on, which is always easy when you’re using a battery-powered chainsaw. It’s a bit tougher when you’re using a gas-powered one, but it shouldn’t be too difficult. If you have to spend 5 minutes yanking on a pull cord every time you need to cut a few logs you’re not going to like it. It’s also very beneficial if you can start the chainsaw easily in winter when it’s a lot colder. Sometimes the only reason the average homeowner is prepared to pick up a chainsaw is because of the built-in safety features. Although you might not fully appreciate them it makes the dangerous power tool much safer to use. It can include features capable of stopping the chain as soon as it encounters a sudden impact or movement. Low-kickback bars will prevent the teeth from flying back directly towards you. Having an automatic oiler to allow smooth cuts will protect you too.